Making homemade corned beef is simply, it just takes time to brine. Barb Randall shares the secrets so you can make your own corned beef. Will you be eating corned beef and cabbage for St. Patrick's Day? I predict thousands of pounds of corned beef will be consumed this weekend as we all pretend to be a wee bit Irish. If I had planned ahead I could have brined a beef brisket to make homemade corned beef. The process is simple but it does require time for the beef to pickle. Alton Brown, the creator and host of the Food Network television show "Good Eats," offers a recipe that calls for beef brisket to sit in brine for five days. What actually is corned beef? Alton explains that corned beef is a salt-cured beef product, usually made with a flat, point or round cut of brisket. The term comes from the treatment of the meat with large-grained rock salt, also called "corns" of salt. see in most store-bought corned beef. Every method of curing corned beef begins with enough water to cover the brisket, usually about a gallon, along with salt and sugar. Boil the water, and dissolve the salt and sugar, as well as the pink curing salt. The pickling spices should be boiled along with this mixture. While many stores sell pre-mixed pickling spices, it is also possible to make a custom spice mix from scratch by toasting and grinding a spice mixture. This method gives chefs more flexibility when it comes to the taste of the corned beef. Once the sugar and salt has been dissolved, remove the water from the heat and allow it to cool to room temperature. The brine should then be refrigerated for several hours until it is cold. Once the brine has cooled, submerge the beef, and allow it to soak for about five days before cooking. After 5 days, remove from the brine and rinse well under cool water. Now you are ready to actually cook the corned beef: Place the brisket in a pot just large enough to hold the meat, add the onion, carrot and celery and cover with water by 1-inch. Set over high heat and bring to a boil. Reduce the heat to low, cover and gently simmer for 2 1/2 or 3 hours or until the meat is fork tender. Remove from the pot and thinly slice across the grain. * Pink salt aka Prague Powder #1, aka DQ Cure is a combination of sodium chloride, sodium nitrite and a bit of pink dye (supposedly added to prevent it being confused for regular salt) is readily available online, but may also be purchased at your local butcher shop or kitchenware store. You can make it without it, but you won't get that pink color. Want to update your corned beef and cabbage dish? Make these, and let the luck of the Irish be upon you. Cook savoy cabbage leaves in boiling water, about 2 minutes. Rinse under cold water and pat dry; slice in half. Mix mayonnaise, chopped parsley and dill; spread on the cabbage leaves. Cut rye bread into strips. 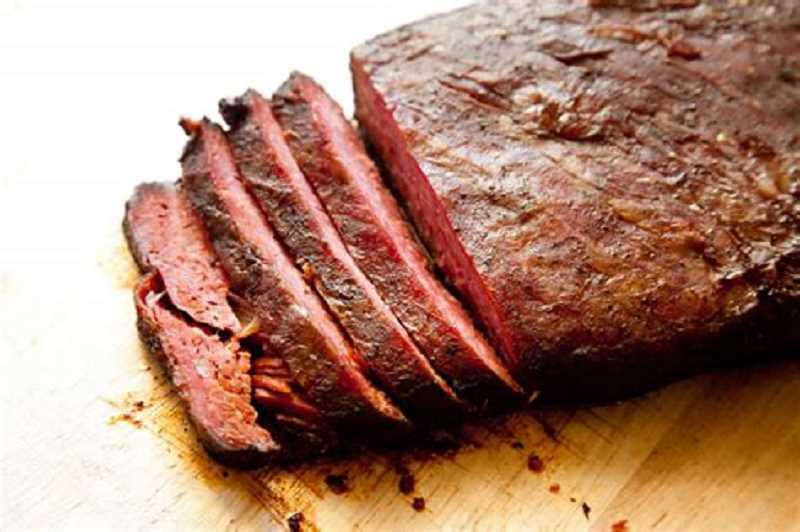 Slice 1/2 pound corned beef into strips and toss with a spoonful of whole-grain mustard. Top the cabbage leaves with a few strips each of the bread and corned beef. Roll up and slice in half.